In November 2016, I dreamed I was with a bunch a people and somehow I knew we were in the southern part of the U.S.A. We were all standing outside, almost frozen with fear as we waited. There had been a HUGE earthquake in the north and we were all filled with dread knowing we were about to feel its effects. It seemed like we were to be the last location that was going feel it coming. I told everyone to hang on. Then, all of a sudden, while waiting for this earthquake to happen, I had a vision within the dream. I saw an outline map of America. 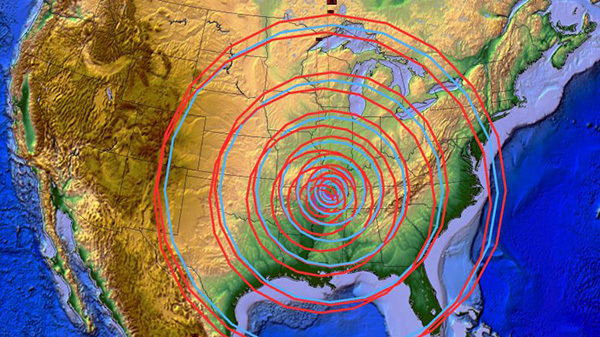 I didn’t see the state lines, but only the outline of the U.S. Then, the map zoomed to where the earthquake started and I saw a black dot pulsating on the epicenter. The dot was in the upper part of the middle of the country, however, I wasn’t sure of which state. It seemed higher than the New Madrid fault. Then I saw ‘9.5’ indicating the level on the Richter Scale. I was not given any dates or timing. I believe this earthquake might have to do with the New Madrid fault and a massive earthquake occurring that will shake the whole country. A few days after the dream, I saw the U.N. voted for a two-state solution in Israel. The LORD then reminded me of this dream and I knew it was related. So, I believe this has something to to do with the division of Israel. Whoever divides HIS land will comes in harms- way according to Scripture. I believe this is about a great divide coming (and has already begun) in the U.S., as we see the lines between good and evil become more and more distinct. This earthquake could unleash more civil unrest in our nation, our communities, as well as within our own families. JESUS said a house divided cannot stand (Mark3:25). I believe that also applies to a nation. The largest earthquake ever recorded was in 1960–a 9.5 in Chile. This goes along with something the Lord showed me. Last week, I was praying about Jn. 14:2, and I happened to ask the Lord if He was really preparing a place in the Father’s house for me. He said “yes.” I asked Him what it was like, and He said to me, “Beautiful.” These places He prepares for us are going to exceed our expectations. We can be thanking Him even now, and setting our hearts there. Wow! I am with you ” The Lord has me thinking more about where I am going next than where I am now. It’s like He is saying “it’s time”. I always wanted to live in the country and have about 5 acres, so when we had to moved due to a job issue, I just assumed that my husband would agree….wrong. Anyway, about 3 years ago I was driving and got to the edge of town, where we live, and was thinking, I wonder what the homes look like past this road. Immediately the Holy Spirit said, ” but if you had one of those homes, you wouldn’t want to move” and he is totally right! If I had land, I would think I could do it myself….No, I need, and I want the Lord! Blessings! Wow Allison, we literally did lose our home in 2008 and everything else. I can see now why God allowed it, for several reasons. We are in a place now on the side of a mountain in the Ozarks, that is an older place and we too have been slowly renovating and fixing it up. Money is tight too, we just finished the kitchen because it basically had no kitchen, it did but did not even have kitchen cabinets. I am the same way, always trying to make a home out of whatever I have as homey as I can. I love to my talents and creativity and landscaping. And it is so hard to look at heaven sometimes as being better, even though we know it will be, we have never seen it, this is all we know. Yes, we actually did go back last summer, when Jonathan Cahn was there with the unveiling of his new ‘Book of Mysteries’. It was a real treat, I got to meet him and get my book signed too. Are you the same Meranda that sent a letter to Lyn Leahz’s website about a dream/vision that a friend of yours had? This is really something, I just listened to her new video yesterday and she mentioned a Meranda and I was trying to find the link to the letter! Alison, in regards to “I am going to be like the mother bird, when she pushes her young out of the nest. They must learn to fly and learn fast or they will die,” it made me think how this word provides spiritual insight into James’ dream about learning to fly posted Nov. 30.
sister what about people who’s health is an issue? Thanks much for this powerful word and comments. I have been reading all the comments coming in since the news about the UN resolution broke. Was tossing and turning in bed early this morning and asked the Lord what He would do. He said that He would split the US and I saw a great jagged crack before my eyes. So I asked when He would do this and the Lord replied – when they begin trying to enforce it. Of course it is clear that Netanyahu will not abide by such decisions made by the UN so they will eventually have to use force. This is terrible. But I do not see tragedy being averted. Since time began, actions have had consequences. We have a just God and He will act. But along with this, we have the written Word that tells us these things will happen near the end. They can not be averted. He will bring judgement where judgement is due and mercy where mercy is due. I see His hands lifting the just up out of danger. There are going to be stories of miraculous escape and of those who are suddenly called away from where they live or work before calamity strikes. Some of you will be learning to fly in the midst of trouble. But be assured that our God has His Hands beneath you, ready to catch you. As I write this, I have a picture of the eagles face – fierce but protective. This is the face of Almighty God, Yahwey, the Sovereign Lord of the universe, but also our Saviour. The same Lord who wills that none perish, who loves us with a love that will not let us go. Thank you Alison for this explanation. On Dec 23, I was praying about this vote and received ” They did not divide My land, but their vote shows their distain for My covenant with Isreal. I will show My distain for them.” It left me wondering if His disdain included an earthquake. Today in prayer, I saw a glimpse of a golden eagle, then a glimpse of an osprey (similar to a bald eagle). I think the golden eagle was to confirm to me your word (which I hadn’t seen yet). The osprey is a clear reminder of a military plane I saw in a dream (called osprey V22) in reference to martial law. Wow Gary Lee, amazing how the Lord gives us these confirmations. Time is running out for America. I do believe the punishment will fit the crime ie if America tries to divide Israel then she herself will be torn asunder. I have heard so many words about this but having heard this directly from the Lord myself I am now in no doubt. It will happen if the UN uphold this resolution. God bless you Alison for your courage and close walk with the Lord. Phil, it’s simple really – the Lord tells me things and I have no rest until I speak about them. I don’t think I am that couragious and my walk with the Lord could be better. Probably we could all say that. But there is an urgency in me to get to the place I need to be in before the Lord. The sure knowledge that time is running out! I sure don’t want to come face to face with Him and have to explain why I did not do all that He told me to do. I am telling American Christians, the big one is coming to where you are! Have you asked the Lord about what you are to do, where you are to go when it hits? Because it is coming. It’s not just a dream someone had that could happen. I feel very stirred up about this. You should prepare yourselves – as in draw near to the Lord that He may shelter you under His wings. If you have been busy decking out your earthly home, feathering your little nest and getting real comfortable with staying in this world, then you may well be on Gods hit list. THIS IS WHAT THE LORD SAID to me. And I know He was speaking in regard to America when He said it. I can’t rest easy until I have told people that this is what He said. It could be 12 months away, I don’t know. But I get the feeling it is much sooner. I would rather speak up and risk getting it wrong than say nothing. He has had me watching the earthquake warning sites for a few years now. I have never seen so many major quakes all within days and hours of one another. This is a major upheaval. One of my favorite verses (NASB version) says: “You hide them in the Secret place of Your Presence from the conspiracies of man; You keep them secretly in a shelter from the strife of tongues.” Ps 31:20 One of the definitions of the Secret Place is His Presence! Your secret place with the Lord is only His and yours! Wherever and whenever you seek His presence–which is WHENEVER you want to just be with Him. liitleedove, that’s just the nature of the spiritual battle we are in. The fact that you are still with the Lord means that you are winning them. To be in battles always gives us experience for the next one. I did find keeping a holy life reduces major pitfalls.That’s no reflection on you. But an element of some of our storms is an area that the enemy can exploit. Jesus said the enemy has nothing in me.He had battles too, of course, but not like the storms we experience at times. Alison, so many times I have posted about a huge earthquake coming to NYC. Most laugh and do not believe. They only think of California but its going to hit the center of NYC and surrounding areas. I have even gone so far to passing out warning flyers about it on the streets of NYC. Any z3ers who live in or near NYC please join me in spreading the word of what is coming and how to prepare. God is so trying to speak to us Alison. For the past two days my eye kept being drawn to nest and I knew its was God trying to speak but didn’t know what. Your word from God brought the clarification. He is pushing us out of our comfortable nests so we can fly and learn to rely on Him and not the nest. Please continue to keep those of us in the NYC area in prayer, that God would make it very clear if and when we should leave and protect us. Thanks Sahran, will pray for you and your family as well. I remember that earthquake as well, people were shocked. Hi…..Im in NJ and on Dec 1st people in southern part of the state felt their homes/businesses shake along with sounds of rumbling. Earlier this year the same thing happened and they chalked it up to military “sonic booms” after a day or two of everyone on edge about it. Perhaps this is the same but it is still strange. I have been watching the earthquake predictions of “Dutchsince” You Tube channel for the last several months. He most likely is not a Christian but he knows something is going on under the earth right now. His 3 day predictions are pretty right on. The whole earth is shaking. Christian woman who asked him directly if he believed in Jesus Christ as his Savior. He unequivocally, without hesitation said yes and gave his testimony. Allison I want to ask you a question. It is about barack obama & if you prefer not to answer I will understand. I believe that he started this mess worldwide and maybe it was meant to be. But I see him as evil, perhaps doing the devil’s work. When I look at him I see lucifer himself. I feel hate for this man for causing serious unrest throughout the world. I know I shouldn’t and am working on this. Has God spoken to you about him. I ask you this because of my problem and this person has assured us that he is not going away. It hurts me to see so many good people in this world trying to fight evil AND the fact that he has a huge following. Thank you in advance. Thanks for sharing this encouragement and exhortation publicly. It’s a real blessing. I shudder to share this dream because it has a date in it, and I don’ t know if it is related to this subject or not because I haven’t been given a clear understanding of the dream yet. I didn’t write it down, so there is a little bit of fuzz. I felt that I should share it, though. In the dream, I was sitting in the spot where I usually sit in church. Pastor said something to the effect of, “I’ve been told that they’re going to make a change on the 12th.” (or something to that effect) I immediately jumped onto the stage, grabbed a microphone and started telling the congregation about how to get prepared. I was emphasizing that they needed at least a month of food and water, but more if they could get it. There was a huge urgency in my message to them like I wanted them to go to the grocery store down the street right away. I woke up after that with no clue what it was all about, but I thought it would be important. This dream and the Israel tie-in, along with Alison Pound’s comment, made me remember it. Again, I don’t know if there is any relation to it or not. At first I thought it might be a financial dream regarding the Fed meeting, but that starts on the 13th. And me getting on stage talking about preparedness with food and water wouldn’t line up with some market activity that would be likely surrounding that meeting.. Please pray about anything I’ve stated here because I sure am. I certainly hope that the U.S. doesn’t abandon Israel a couple of days from now. I hope the 12th comes and goes with nothing significant. Could the 12th be the 12th month–as in December? There have been a lot of people that have had dreams/visions about trouble/crisis happening at Christmas time, though we don’t know the year. That would be close to the time of the third super moon. The 7.8 mag earthquake hit New Zealand around the time of the second super moon. The recent earthquake in the Solomon Islands (7.7) has some claiming that the whole Pacific plate may be showing increased seismic activity. The 6.5 mag that just hit off the coast of California seems to confirm this. Two good sources on earthquake prediction are Dutchsinse and Suspicious Observers. Well, I guess Yahweh is going to let me know what to do when this happens. I can’t help but laugh because I live near Scott AFB in IL and we are twenty minutes from STL. We just bought our home this year in July and it seems we are about to lose it. That’s ok though, obviously God has a better home for us to live in. Like the message says, this is not our home and we are only here temporarily. I’ll have to set more time aside to try and hear His voice. He has not granted me that privilege yet, but he has give me dreams. Now that I think about it He may have given me a dream about this event. Well, I’m off to listen to my audio bible and try to focus on Him! God bless you all and thank you for your word. Oh and if I may be so bold, please pray that He does grant me revelation upon what His plans are for me in this time to come and for the safety and conversion of my wife, family and friends. Jameel, you don’t need to try to hear God’s voice more than you have been doing. Just ask Him to speak to you, and He will, by any event, or something somebody says, or by something from the Bible that seems to stand out to you. He may speak at once, or in a few days.He may give you thoughts in your mind that you know come from Him. When you pray about anything, give God time to reply to you. Just be relaxed about it.As I think you are. I live in Springfield, IL. Just 1 hour south of you in Peoria. I highly recommend you purchase earthquake insurance if you’re a homeowner. It costs me $1/week for it. I think it’s just prudent and makes good sense. There is historical precedence for a big earthquake in this area of the country and earthquake experts are saying it’s going to happen again. It’s just a matter of when. Insurance can’t save your soul, of course. But, I believe we are called to be wise stewards of what we have, and to make common sense decisions. Spending $1/week for some peace of mind for you and your loved ones, especially when you know that you live in an earthquake-prone area of the country, I think makes good common and spiritual sense. Of course, so many people in this area of the country are checked out and ignorant that they don’t even know we live in an earthquake zone, and could experience the ‘big one’ really at any minute. It’s truly unfortunate. So, whenever I have the opportunity, I like to remind people of that fact. What I share with you all is not easy for me. I prefer to remain in the background serving our Father God Almighty. Early this past Monday the 5th I had a dream I believe was from our Father. In the dream I was lying on the ground in prayer and suddenly felt the power of God on me. God spoke through me that He was going to “divide the land”. God also said “thus saith the Lord”. The prayer ended with the words “Prepare, prepare, prepare”. Right after the prayer I saw chaos in the streets around me with people (especially young men) shooting guns. While the Lord was speaking through me I had the impression that He was meaning the physical land not society. This is confirmation for me. I’ve had a series of 3 dreams of a huge earthquake within the last 7 years. I know God told me to prepare my heart for what’s ahead. Lord I pray for mercy on your people everywhere!!!! Especially for those that can not afford to prepare. In Jesus name!!! I had a dream and the woman in my dream was very upset and stated that there was a different feeling in the world and everything has changed. She was very scared. I did not feel her fear in the dream. I wonder, is there anyone else feeling a lack of Christmas “spirit”; I am not sure if it is a lack of joy, or just a refusal to join in the buying frenzy. I’m making a resolution not to read any Z3 posts for 3 months. I am getting depressed!!! I love dreams/visions etc. It is my favorite language! Adios amigos and feliz navida! The Whoosssh sound of the door closing fast; an ominous feeling of dread, a reality, knowing that God will not let America slide for her MANY transgressions. Be ready to meet your God at all times-the Fear of the Lord and clean living and obedience coupled with Love and forgives will see you through. I believe that this will happen soon. It’s been heavy on my heart that this will happen soon. Every country in the world’s almost are having major quakes. America hasn’t had one yet. Plus when this happen the division I believe will be complete. I’ve been warning a lot of my family in Illinois to go to God in prayer to see if he wants them to move. Just prepare people get all that you need in order. Heart right with God first and everything else will fall in place. Today the U.N. passed six resolutions against Israel. The UN is largely an Israel-hating organization. When you go back in history and look over the past several years….you see all sorts of measures/resolutions they’ve made against Israel. It’s pathetic. I also want to tell you something else. Canada is the ONLY true Western friend that Israel had, and I say had, because the catalyst behind that (Prime Minister Harper) is sadly no longer in power as of the last several months. Especially in recent years, when the United States has turned their back on Israel, Canada has continued to speak out in Israel’s defense. And, make no mistake, they paid a price for that with regard to their standing with other countries. But, they did it anyway. As a dual Canadian/American I couldn’t be more proud of Canada for taking the stand they did. Of course, with their current PM in power now… ha….. good luck with taking the ‘moral way’ on anything. It’s all about the fluff and pretty hair now. Francine, the two state solution will probably happen and the 21 judgments of Revelation will happen but this was all seen by God from the foundations of the earth. God warns us three times in the scriptures that if Israel is forced to divide the land judgment will fall on mankind. Call me a fatalist but it’s gonna happen. I don’t get all worked up about because Jesus is coming when finally His will will be done on earth as it is in Heaven. Come quickly Lord Jesus. Bob, I agree. You are not fatalist to believe what the bible says, i also know it will happen. We just don’t know the date…Now, even if we know the land will be divided in the end, we still need to stand for Israel and carry the message that God instruct us to carry (may not be the same for everyone). Just like, Jeremiah had to do in his life time. Again, what the Nov 30th UN vote tells me, we are in the end times, another proof. Be blessed. McKenzie King wasn’t alone before Roosevelt through Pearl Harbor dragged us into WW II. Henry Ford, Charles Lindbergh and most of the country didn’t want to be tricked into another European war. Most felt it was a mistake that we ever entered WW I. Roosevelt and the international banksters used every trick to pull us into the war, calling the Germans Huns even though most Americans at the time could trace part of their heritage to Germany. The Brits declared war on Germany to save the port city of Danzig that had voted to be returned to Germany after being stolen from Germany and given to Poland at Versailles. This was a city that had been German from it’s earliest beginnings. Results of the war: 50 million dead, GB loses her empire and goes broke, half of Europe falls under Godless communist slavery and the Cold War begins. Truman and his communist infiltrated administration had to quickly rebuild Germany as fortress to protect Western Europe from Russian aggression. Thank you banksters of Wall Street who financed Hitler’s rise, including Prescott Bush. Tell me Joe, have the Canadians been Israel’s best friend because they are all born again Christians well versed in the Bible and promises God made to the patriarchs? Your question sounds a bit facetious (and I don’t have time for bitter Internet debates…. if that’s where this is going). It had nothing to do with what you said in your comment. Canada has largely turned into a secular nation, just as the United States has. You know that… right??? I would hope so. It had to do with a Canadian Prime Minister whose priority was Israel. He believed that the very existence of Israel was at stake, and he chose to take the path less traveled, and make a stand with Israel. To be clear, many Canadians weren’t happy with that position either. You’re probably more of a Bible scholar than I am, and if you are, you would know that God promises to bless those who bless his people (that’s not just a promise for ‘Christians’ either). I believe that God’s blessing has remained on Canada longer than the United States because Canada chose to recognize Israel for the special chosen people they are, while our President Obama has chosen to kick Israel to the curb for the past several years. That is all I’m saying on this matter. You can google all kinds of stuff on this matter if you feel so inclined. It is well documented that Canada was pro-Israel up until the last several months when they elected a school teacher to lead their great country. Joe, forgive me for being facetious. My point is most people are guided more by news media and the secular culture than by the Bible. To the secular world, with the exception of the US and Canada, the land of Israel was stolen from the Muslims after the Ottoman Empire fell following WW I which had been their possession for 2,000 years. Some might even know that God dispersed the Jews from the land to the four corners of the world because of disobedience. My point is that it’s not so “pathetic” as you said, as it is ironic that world is more correct in a secular way but I join you in rejoicing in the Jews return to the Promised Land that was given to them by God.